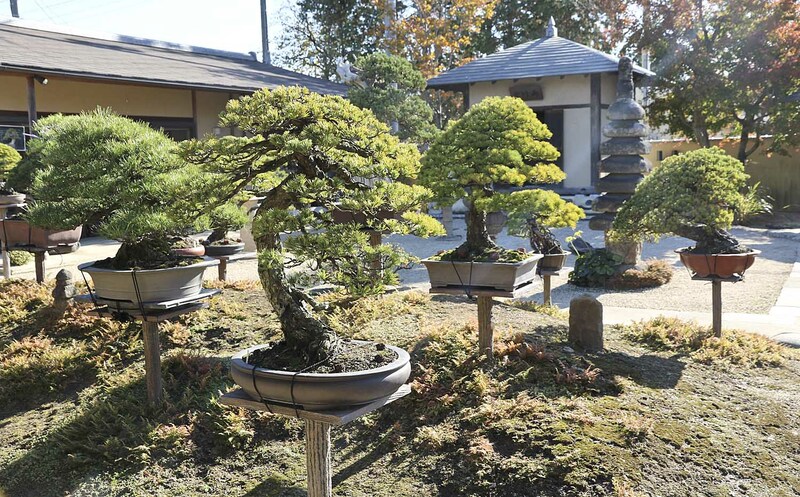 Kora Dalager and I are back in Japan showing ten people the best of the Japanese bonsai world and the Taikan Bonsai Exhibition in Kyoto this coming weekend. We have tour members from California, Texas, Virginia, Pennsylvania New York, and Switzerland. 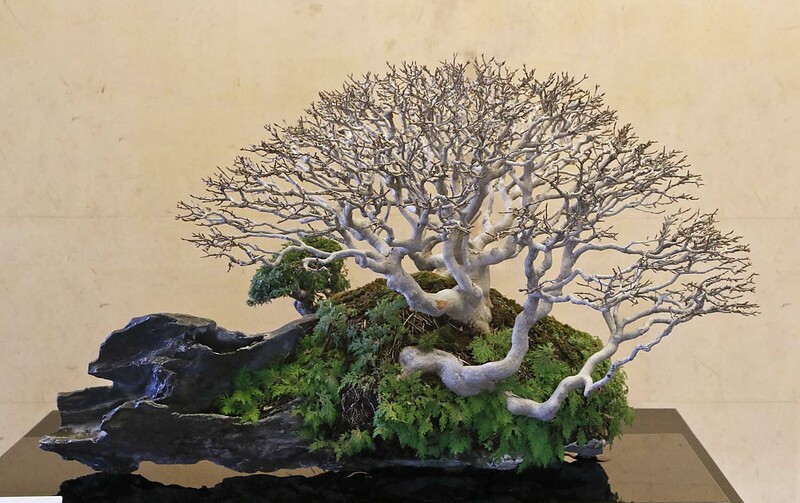 I brought a large and heavy box of four suiseki for the 2nd Japan Suiseki Exhibition which will be held during part 2 of the Kokufu Bonsai Exhibition in February. The stones need to be here now to be photographed for the exhibition album. I brought suiseki from Sean Smith, Mike Pollock, Jake Wilson as well as mine all carefully packed. I was afraid TSA would open the box, as it was well taped and sealed and I know they could never seal it again. The box was even labeled “Rocks” because it is X-rayed. It arrived in perfect condition at Narita, then I had to take it through customs. The customs agent wanted to know what is in the box. I said four stones. She said stones? Why? I told her they were suiseki. She said what’s that? 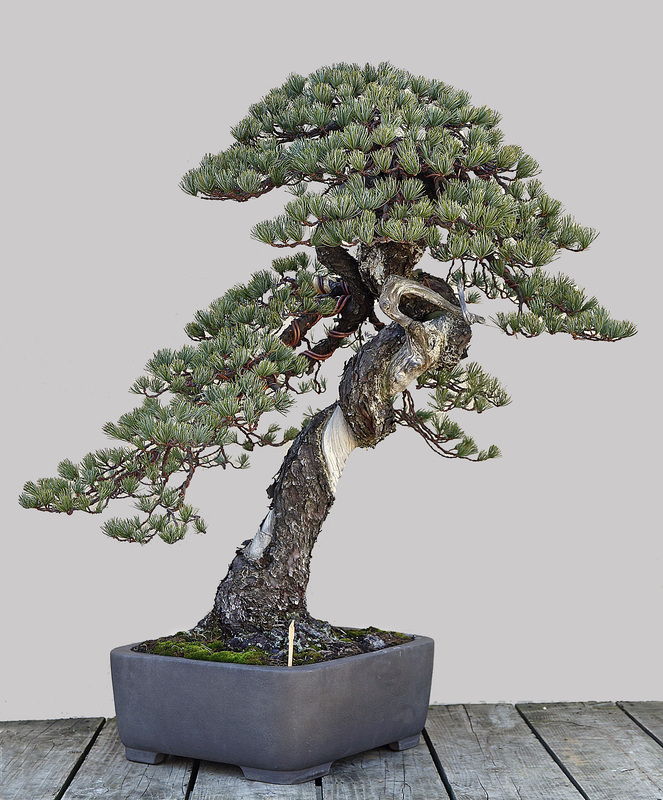 OK, so I needed to explain what a suiseki is and how they are displayed with bonsai and even wrote out the two Japanese kanji characters for suiseki. She was still clueless. Why are they here? For an exhibition, and they are not staying in Japan. Where is the commercial invoice? There is no invoice. How about a flyer? No flyer. Well, what is your occupation? I learned years ago it was too difficult to explain that I’m a bonsai artist and educator, so simply say “publisher” which is correct too. 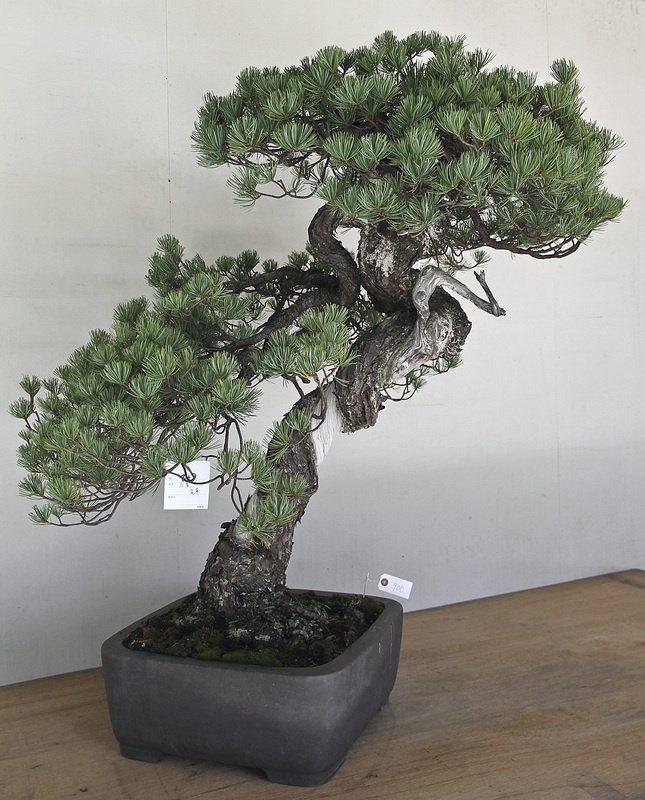 Then I showed her my name card and she said “Bonsai!” OK, just leave…. 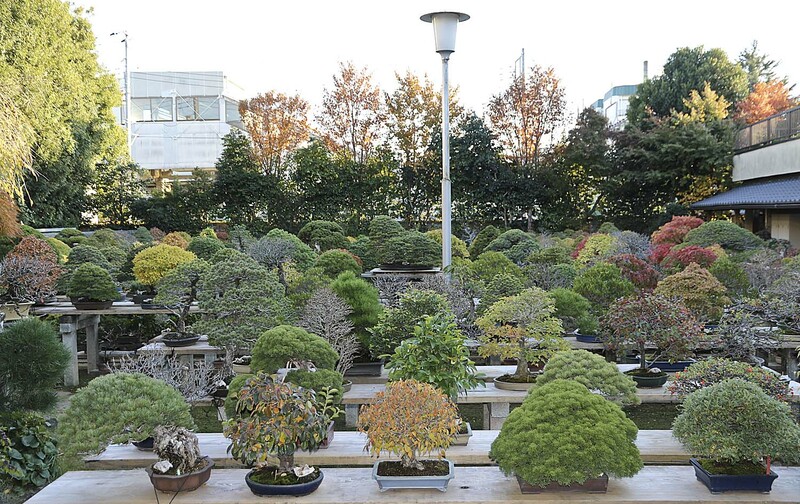 We first visited S-Cube, the bonsai garden of Seiji Morimae, who is always a gracious host. We visited his garden first, rather than last on our schedule and the sun was great. 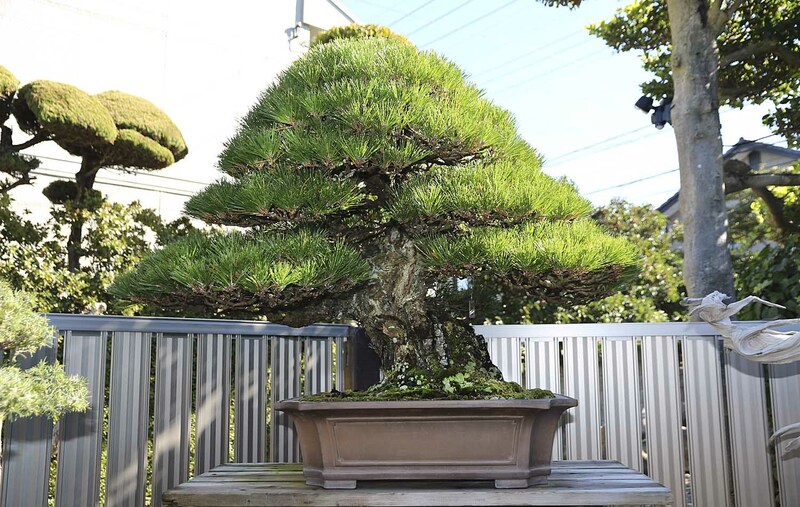 In October I attended an auction at the Ueno Green Club for professional bonsai artists where Mr. Morimae purchased an old expensive famous Japanese five-needle pine. The tree needed wiring and shaping. 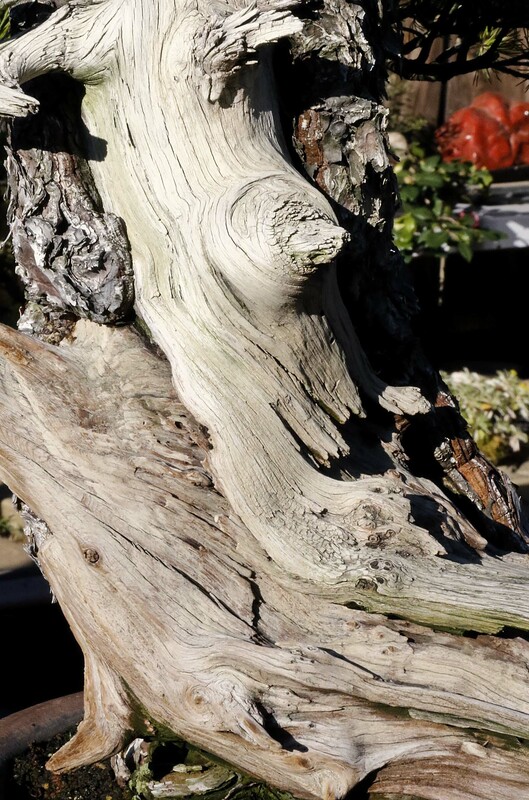 I recognized the tree and when I went home found an old photo of it 70 years ago in my bonsai reference library. 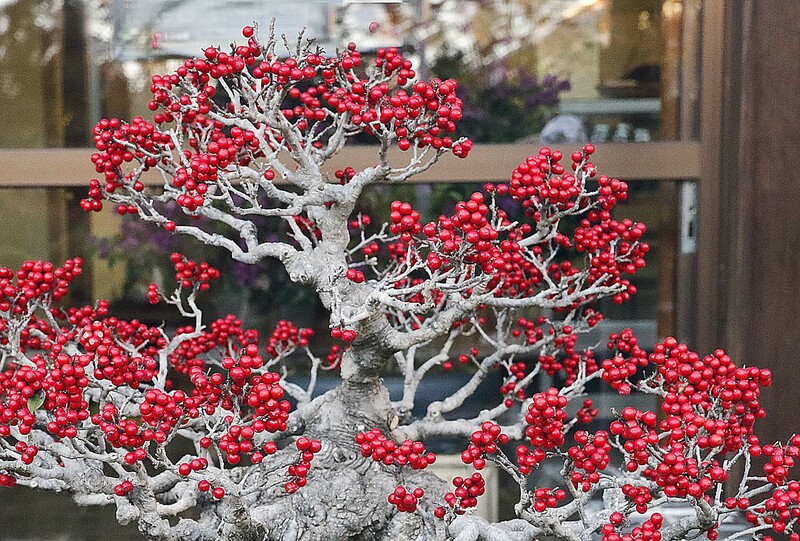 Mr. Morimae said Hotsumi Terakawa shaped the tree for him and it’s arriving soon. 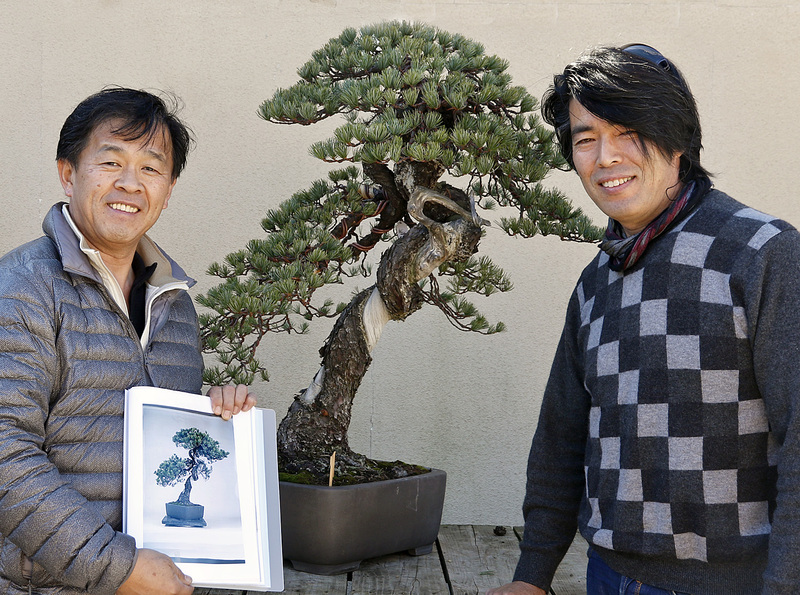 A few minutes later Mr. Terakawa unloaded the bonsai and it’s beautiful. It took him three days to wire and only removed one small branch. Of course Mr. Morimae had to adjust a couple of branches. 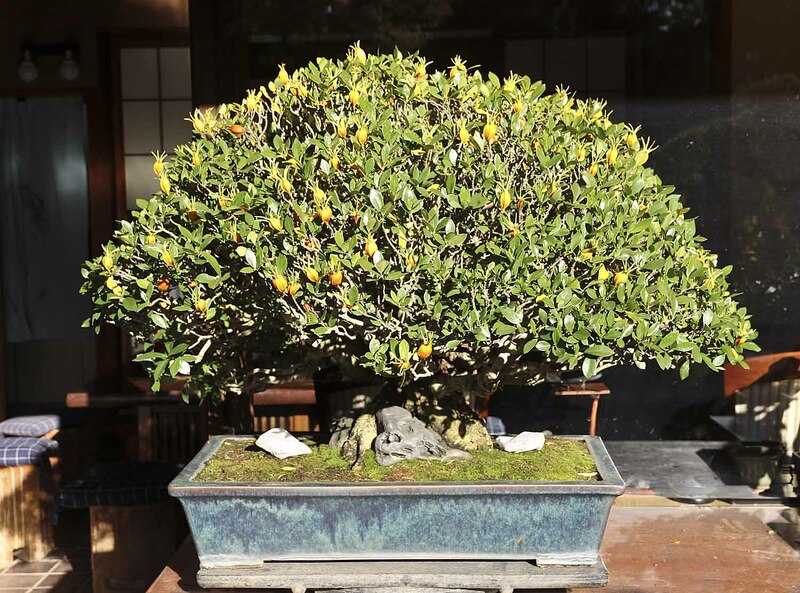 He will now transplant the masterpiece into an antique Chinese mirror shaped container so the tree could be viewed from different sides. Our group next visited Masahiko Kimura where Marco Invernizzi is currently studying. I noticed a new unusual rock planting on an angle constructed of clay. Also new is a metal fence behind Mr. Kimura’s main display area. 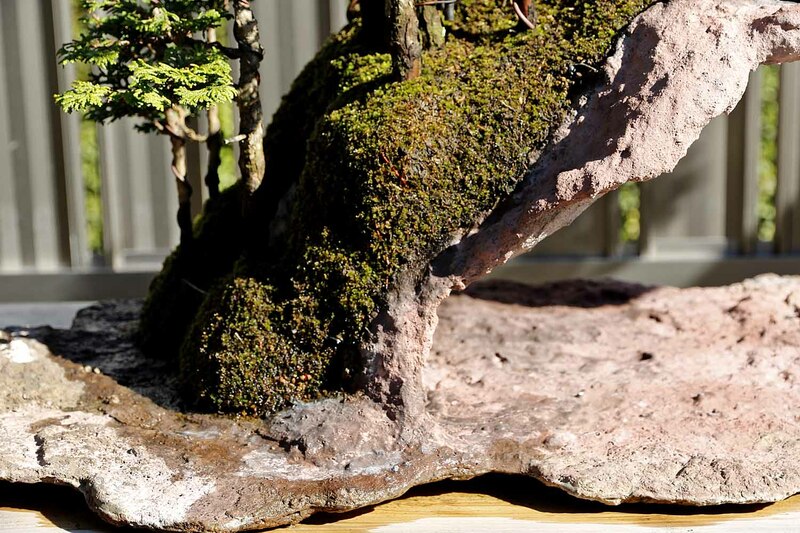 All the trees were immaculate and several were being prepared for display at the Taikan Bonsai Exhibition this weekend. 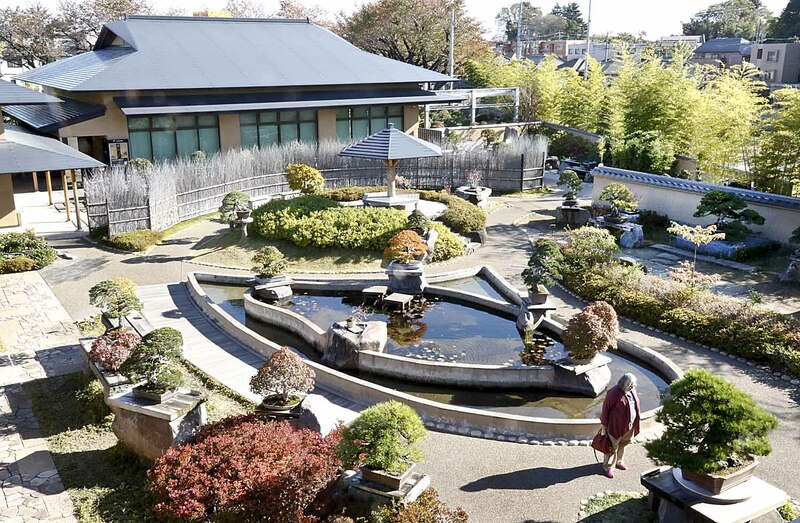 Omiya Bonsai Museum was our next stop and we were lucky to come during BONSAN- A Special Exhibition. 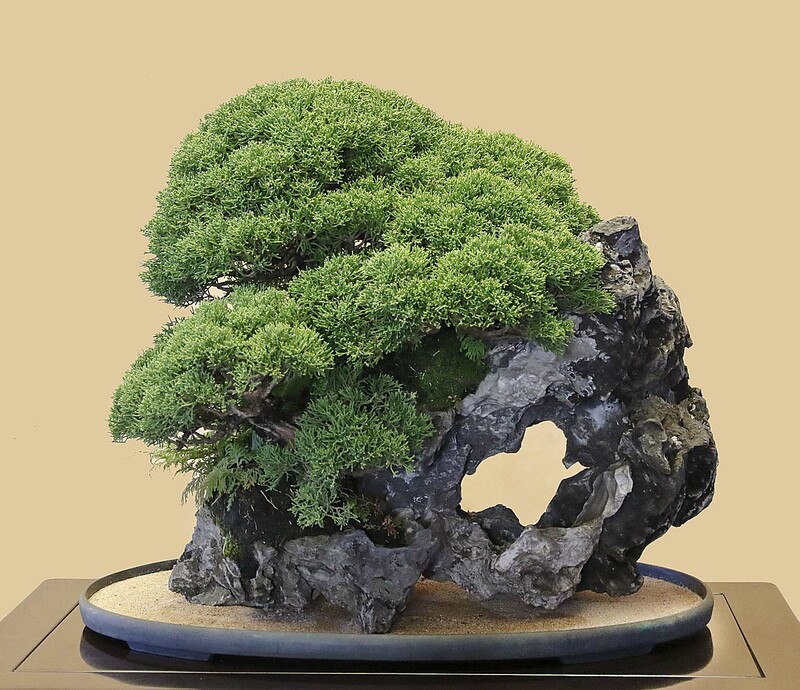 Bonsan is the practice of growing trees and flowering plants in hollows or depressions of stones; a practice presently called “ishitsuki”, or rock plantings today. 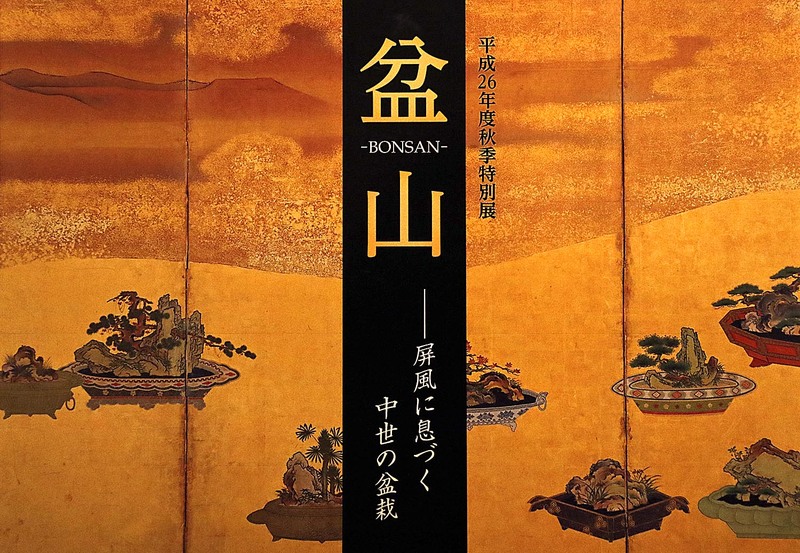 An album was published showing old paintings of how bonsan were used in the 13th Century Japan. 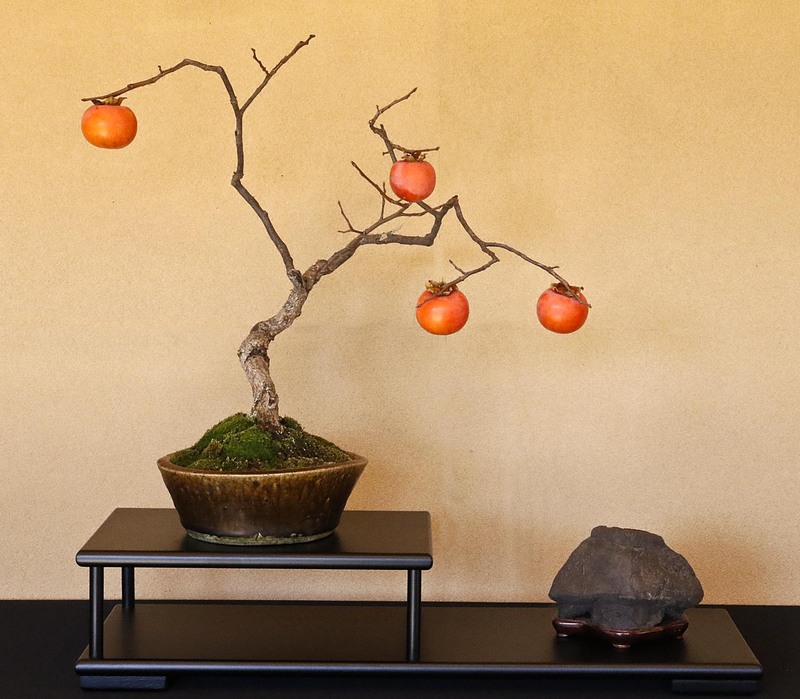 Entering the museum were two beautiful rock plantings, a Trident maple and Sargent juniper which was from Mansei-en Bonsai Garden of Hatsuji Kato. 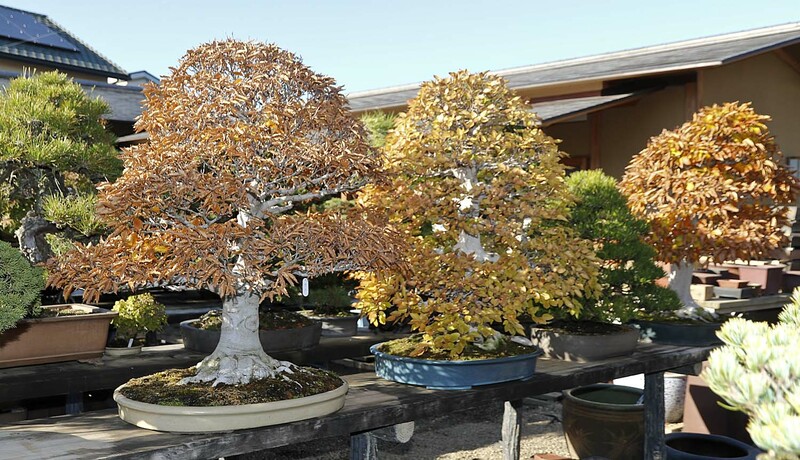 Tomio Yamada displayed his Trident maple and I remember watching him create it in June 1970, nearly 45 years ago. Other bonsai in the gallery all featured bonsai with stones as well. 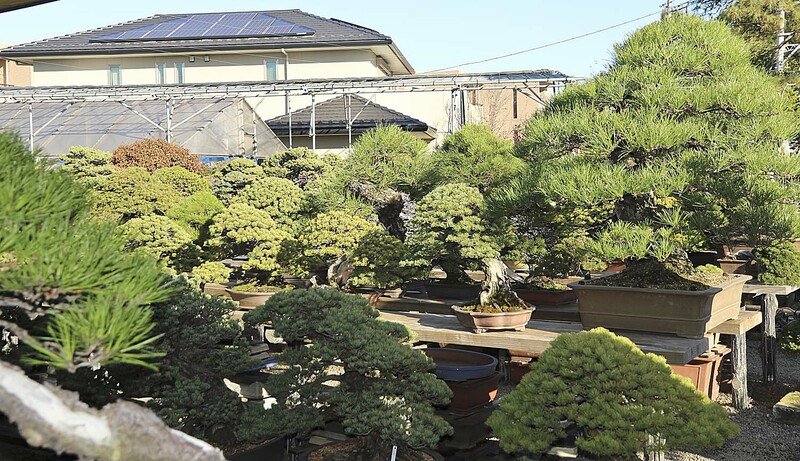 Mansei-en was our next stop in Omiya Bonsai Village. 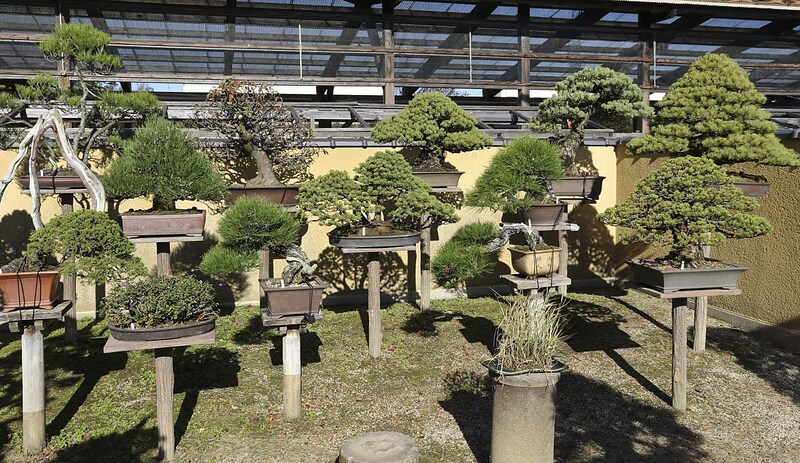 As usual there were many famous masterpieces and some were being prepared for the Taikan Bonsai Exhibition. 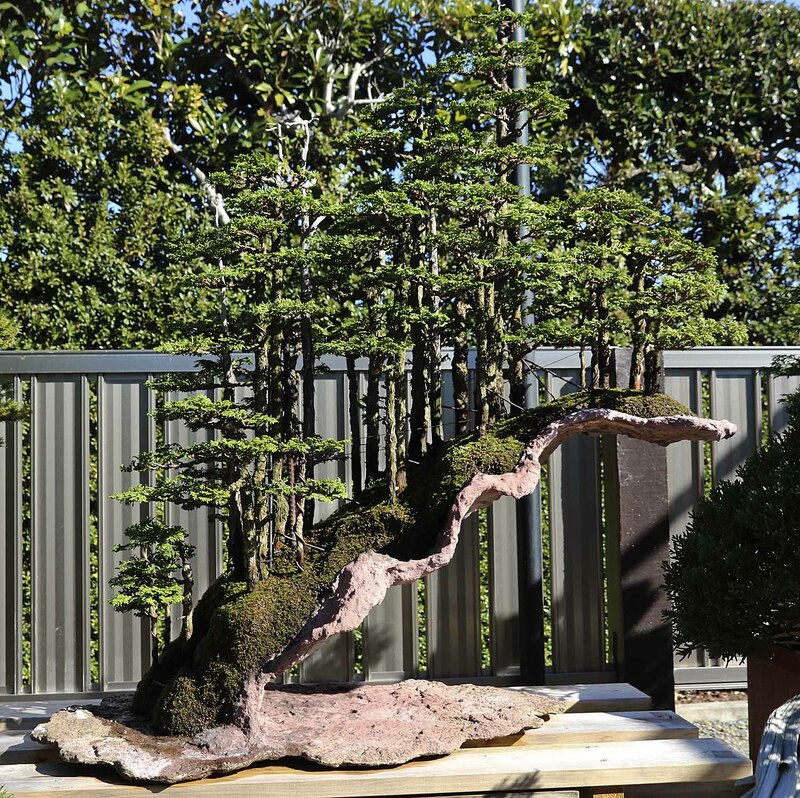 Masashi Hirao was there placing moss on a large Kiyo Hime Japanese maple bonsai. The sunlight was quite bright and the container could not be easily seen, but I noticed that it was unglazed brown. 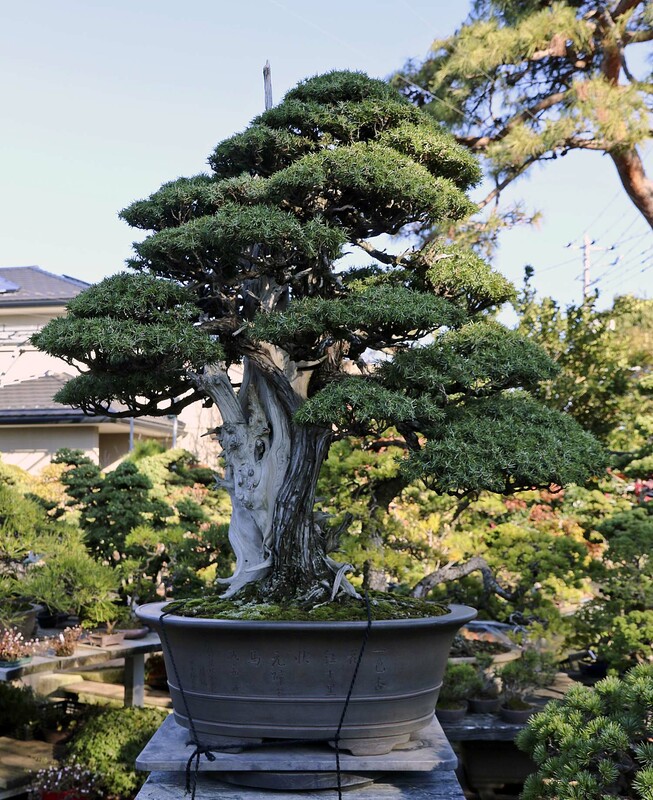 I asked Mr. Hirao about the container because this bonsai won one of the coveted Kokufu prizes in February and was in an Antique blue Chinese container. Why was the container changed? He said that the blue container just for the exhibition. It was transplanted afterwards into another container. 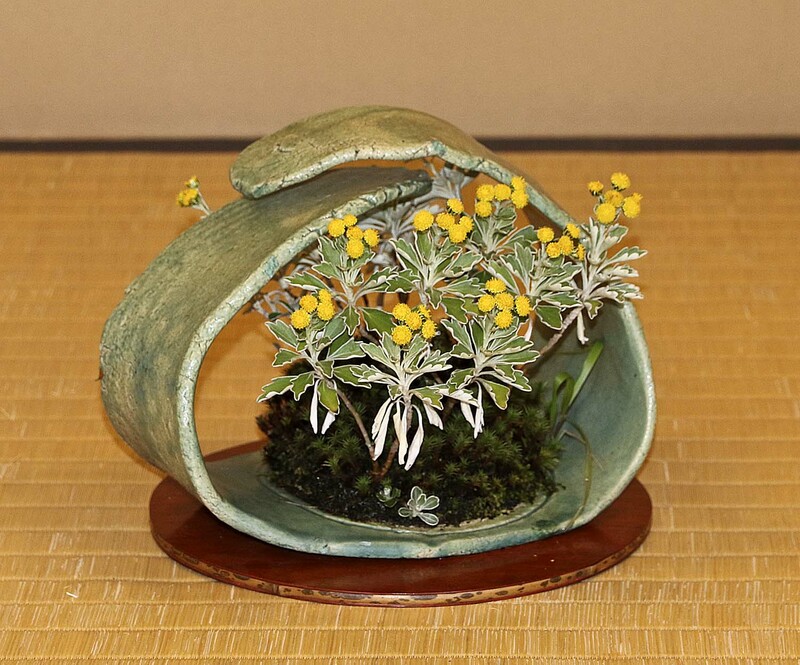 There was no need to put it in such a valuable container now since it already won the highest prize in Japan and is no longer eligible for winning. 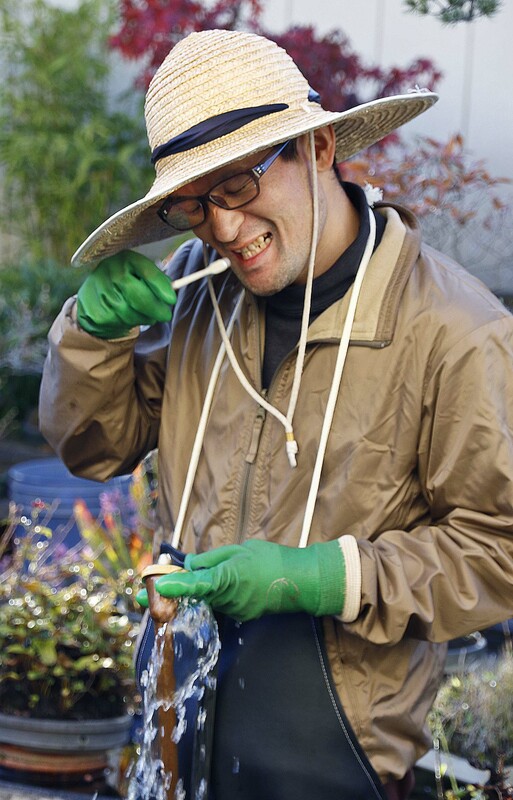 Masashi Hirao placing moss for the exhibition. I’ll take a proper photo this weekend showing the brown container. 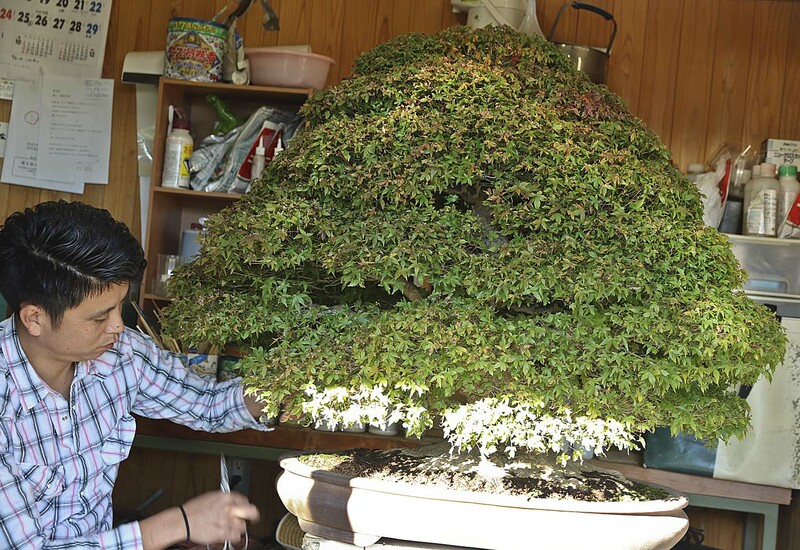 Tomio Yamada’s Seiko-en Bonsai Garden was next and his bonsai were quite colorful. 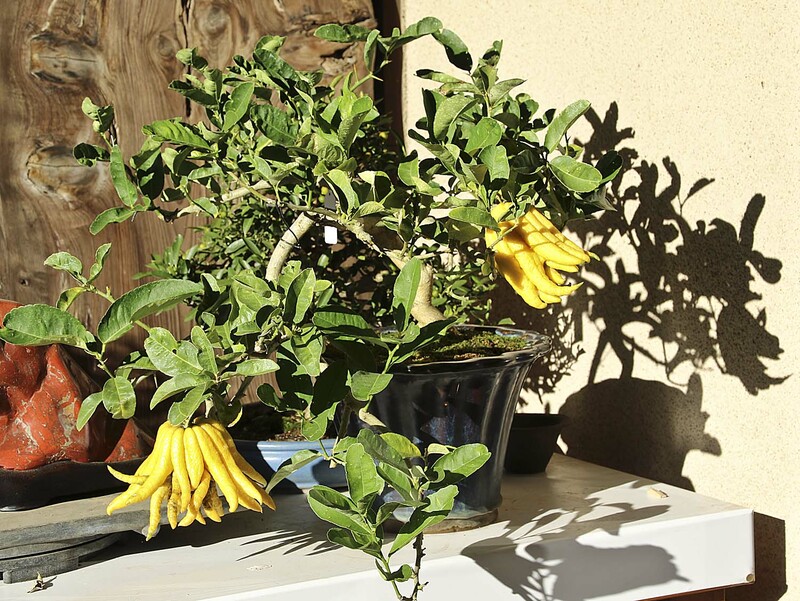 I was immediately attracted to a Fingered citron bonsai with large, strange yellow fruit. 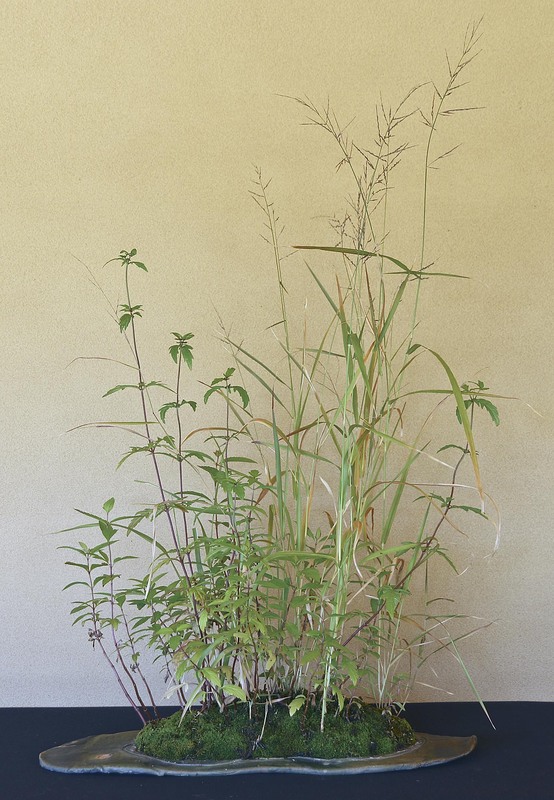 Two other specimens of the same species were also displayed in Hiroshi Takeyama’s garden also. 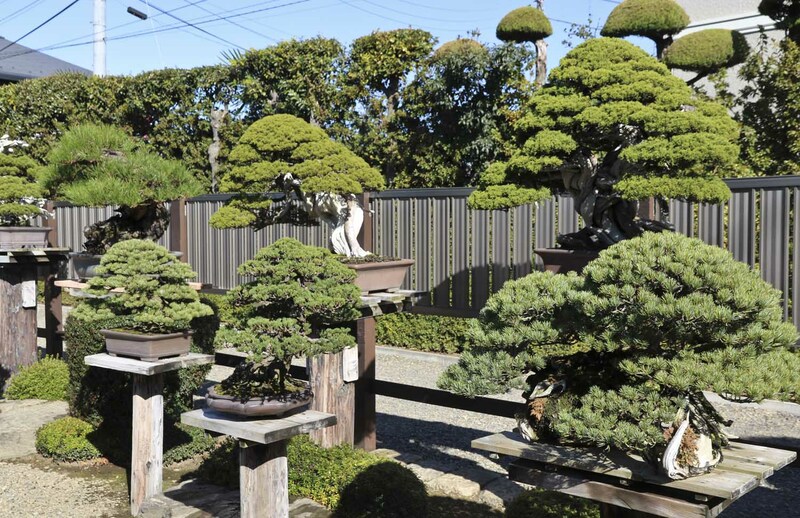 Kyuka-en Bonsai Garden was around the corner and that’s were I first apprenticed bonsai in Japan in 1970. 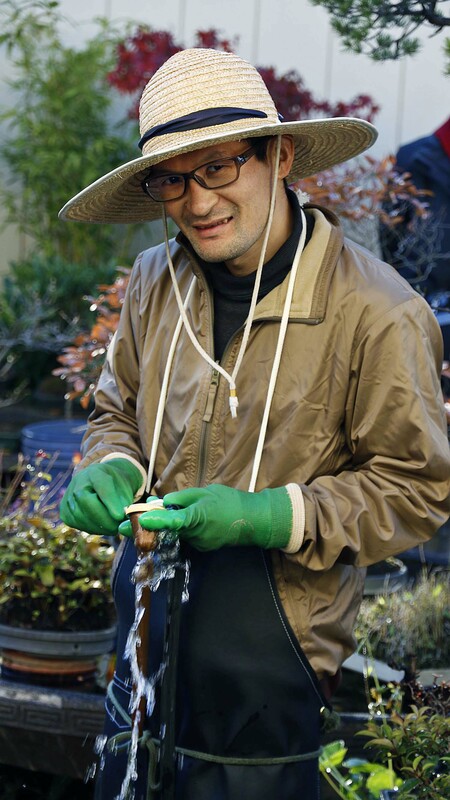 Third generation proprietor Yukio Murata was watering and had a tooth brush in his hand. I thought he might be washing trunks as he went through his garden. But, after I asked him he said the toothbrush was used to clean out the nozzle because it gets clogged with debris from the deep well. He removed the nozzle to show me and also said he sometimes brushes his teeth as well while watering. 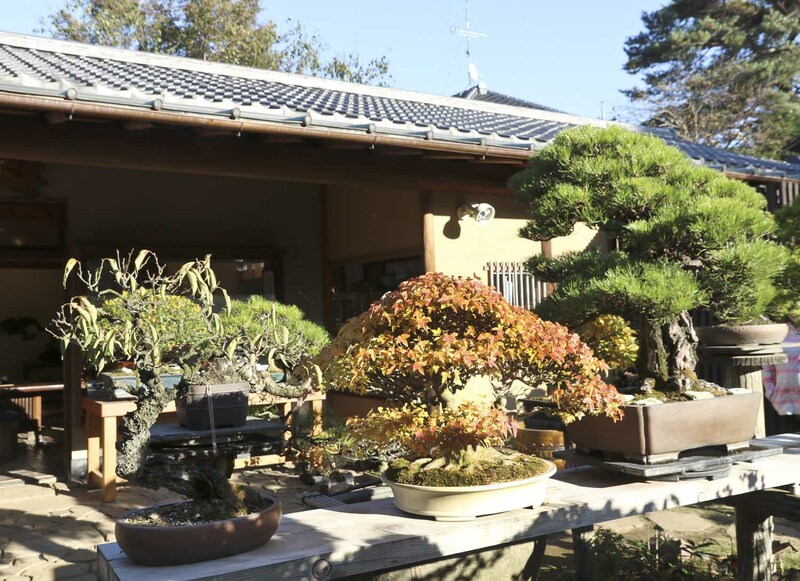 Mr. Takeyama’s garden featuring deciduous and unusual bonsai was not quite a colorful as in the past, but it was a bit early for his garden. 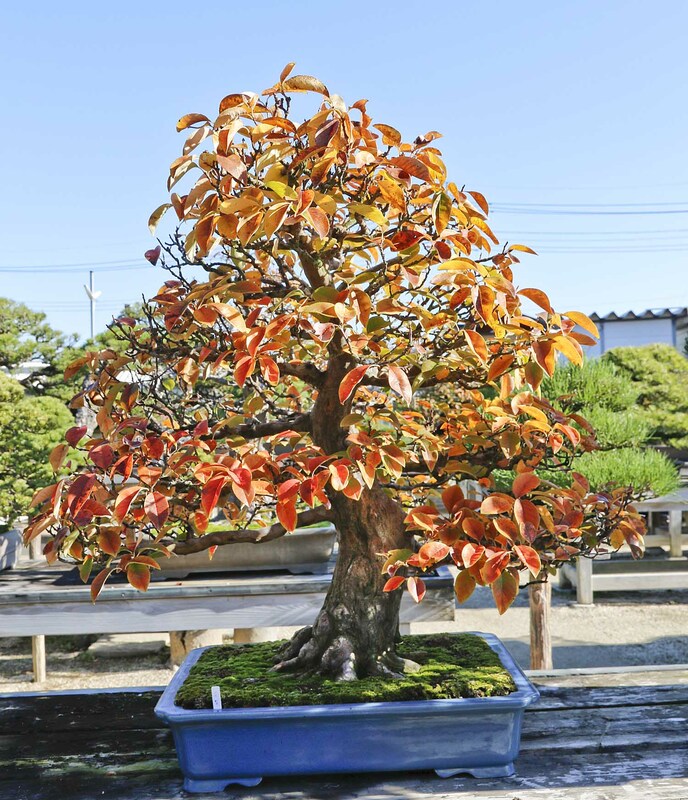 There were a few Japanese maples in bright red coloring and the Korean hornbeams were past prime. The autumn coloring during next few weeks are going to be spectacular in this garden. Excellent post, Bill. Sounds like you are having a great time. 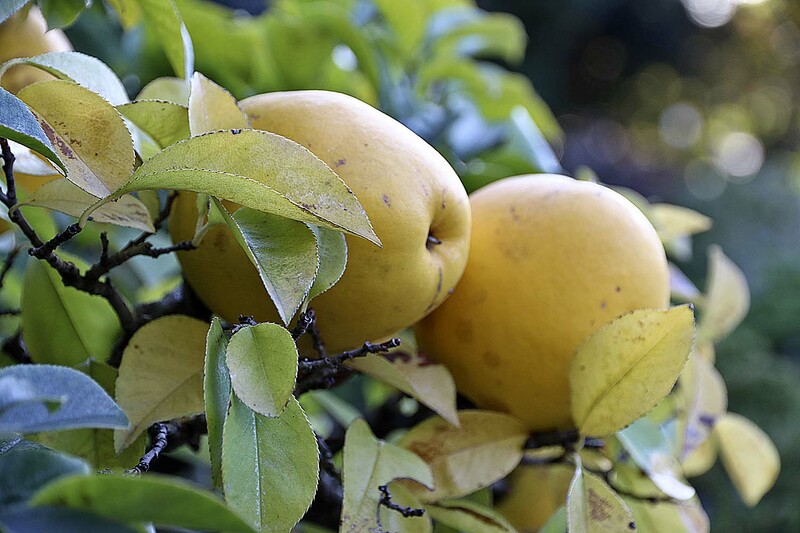 Love that quince with 4 fruit. Even though 4 is not a propitious number. 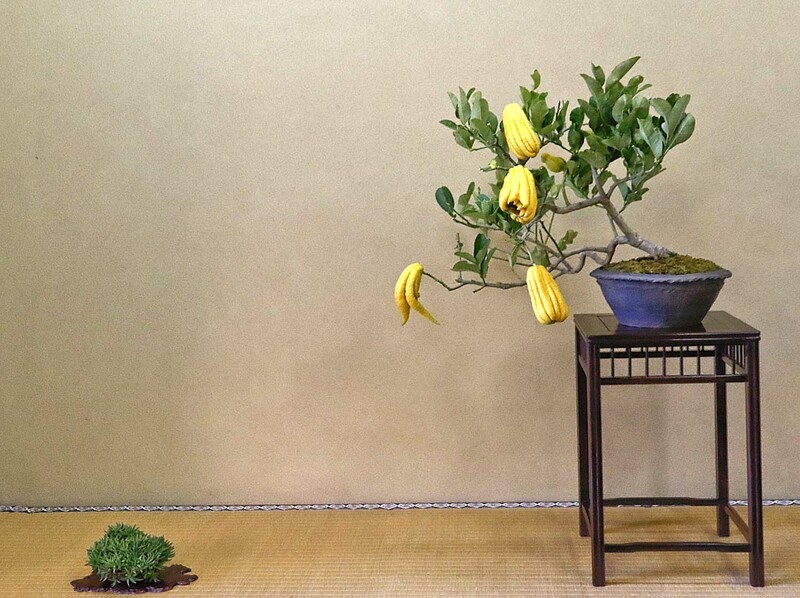 Reblogged this on Lyons Bonsai. Bill, Thank you for sharing your travels with us. It is appreciated. 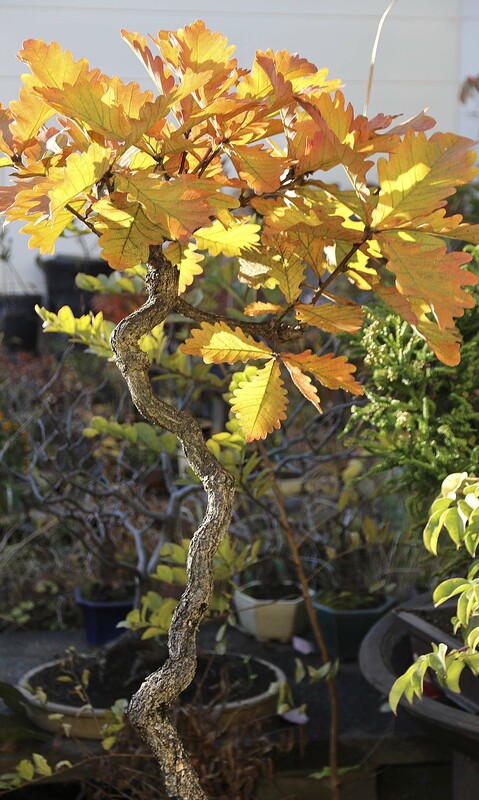 In the photo of a tree just above where Mr. Murata is cleaning the watering nozzle there is a tree that looks to be an Oak. 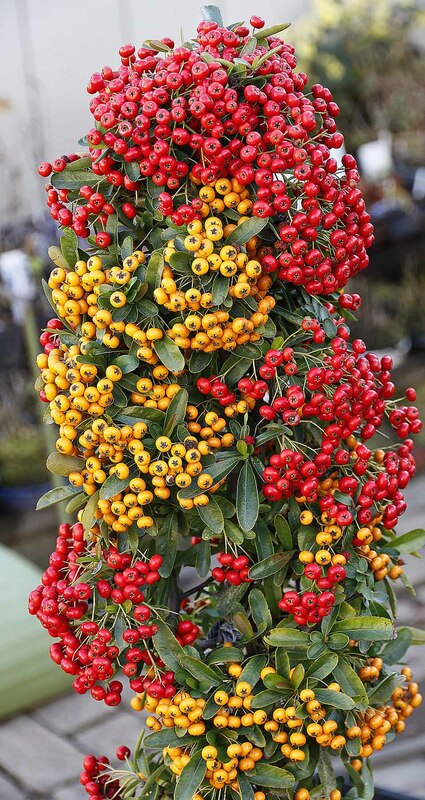 Can you confirm that it is and what variety? Yes, it’s an Oak, perhaps Quercus dentate?